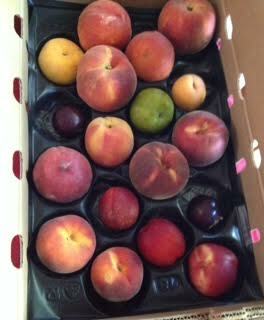 And the plums and the apricots and the nectarines. I snapped a picture as soon as we got home because that box was going down, and fast. 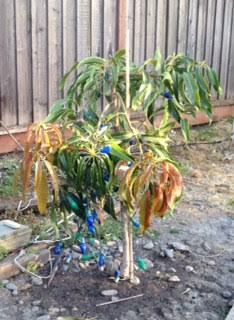 I gave up on sweet-smelling flowers, much less fruit, and pruned the mango a lot last week. It looked so shrunken afterwards but it was overdue. It was supposed to have ripening mangoes by now. It was just sitting there, the limbs getting a bit longer but nothing else, when last year, it was starting to flush in January. January! Three weeks ago I did, reluctantly, prune just two branches, my first time ever, baby steps towards seeing whether that would change anything. Oh boy did it. One, and actually one that I did not, almost immediately sprang into the flush of growth you see here–but the other one I pruned is shaded by the rest of the tree and is still taking its time. Now, how you prune a tree when you don’t know what its long term growth patterns are is a mystery. What I’ve seen in its first 18 months: the trunk goes up. Then it curves over. Then the branches hang down in the winter. Then they do a wavy curl back upwards in spring, and whether they harden that way or not, whether the new sprouts that showed up at the top in the last two days will continue upwards for long, I don’t know. It’s not a trunk–it’s a puzzle piece. Cut the branches to about two feet long the first two years, Fairchild Gardens says. Okay. The reddish new growth on the lower left of the tree? I’d read that the trick is to cut just past where there’s a grouping of leaves rather than a single one. I did. There are five new not leaves but full branches from it. I like that rate of return. Cut where there’s a single leaf you’ll get a single branch. Or so they say. But I found for the first time and bought a pair (and you do need two layers) of bigger frost covers for the coming winter, and I mean big, like, ten feet tall big. So now I don’t have to worry about it growing larger this year than I can keep protected. I didn’t prune all the branches (see last photo). Maybe there’s still some last flowering hope? The bees so ardently love those blossoms, and so do I, and now that I know my next-door neighbors have a beehive, I can only imagine what their honey could taste like. Whatever. I think my tree is suddenly going to be much, much fuller. Next year we will have mangoes. One of the things Ann mentioned in passing on Saturday was that her husband was not a morning person and sometimes you just stayed a little out of his way first thing till he cheered up and became his normal self. “So that’s where you get it from,” with a wry smile from my husband: clearly it was a family thing. Last winter my sweetie went on a business trip to the East Coast. And I found myself at midnight with a very very cold house and a thermostat that refused to play nice, to put it mildly. We had installed a Nest, which was operated by our cellphones. It was paying attention to his–and his said he was 3000 miles away, so it had automatically gone into keep-the-pipes-from-freezing mode. But I was right here! I grabbed my phone and Nest didn’t recognize it. Richard had set it up and I had no idea what username or password were supposed to be nor where I might look it up. Calling him at 3 am his time to ask probably wouldn’t go over well. I’d okayed it, he’d bought it and installed it and I don’t remember so much as even seeing an owner’s manual. Wait, he’d mentioned something about you can squeeze the thermostat to change the temp. So I tried that. One degree, two–and then suddenly it flipped way over to Cool and the air conditioning clicked on. NO! Fast, I tried to turn it back but no dice. I tried again. At some point I did get the AC to at least turn off but other than that, it went into “a little child is playing with me” mode and went dark and refused all attempts to reason with it. No heat for you. It is safe to say we were not friends at this point. I gave it a few minutes and tried again. As I turned to heat it flipped to AC, I let go quick, and it went dark again. It was not a happy night. My husband, once he found out in the morning, overrode the control to go back to normal heating and saved my very tired day and said he’d figure out what was wrong with my phone’s app when he got home. When the thing works it works so well you just never think about it. You don’t have to worry about resetting between the furnace and the air conditioning as seasons or temps change, it just takes care of it and most of the time it’s a huge improvement over the 25-year-old thing it replaced. Last night I couldn’t sleep. It was getting hot (how?) and I knew I shouldn’t have had that chocolate that late. At 2:45 am the room lit up: his Samsung tablet, which was supposed to be on night setting, was at full-blast-lightshow. Dang. I got up, walked around the bed, put it face down and half-covered where it still light-leaked, and got thwacked by my husband’s arm as he rolled over asleep. And it was hot. This made no sense. It was 55 degrees outside. Yes it had been a warm day and we’d run the oven for a roast but that had been hours before and how on earth was he sleeping when it was this hot? Checked my phone. Nest still didn’t recognize me there, dang it. Went to the thermostat and re-enacted last winter, in reverse: squeeze, turn. It went to heat. NO! Tried again. “A little child is playing with me” mode. Dark. Came back. Tried again. Got it down to 72, let go quick before it threw another hissy fit while I had it that good, hauled myself to bed directly below the vent as cool sweet cool began to blow down on my face. But I did not sleep. 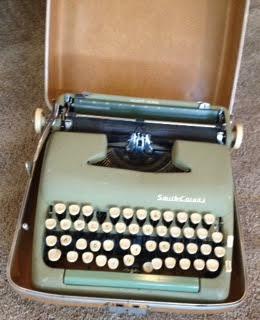 My brain was writing scathing Amazon reviews of, I LOATHE this thing. Dawn came. Well, that was a waste of a night. Thought about getting up but for the chest pains. Now, I mentioned to my doctor Friday about the chest pains. They come and go and they’re generally an annoying but non-threatening part of being a lupus patient and he found nothing wrong, but when they’re persistently there at night or in the morning one really should mention it so I did, and now I have a cardiology appointment and a mildly worried husband. And they’re gone for the day and I’m fine now but it’s the middle of the afternoon and everything’s better then. So. One of the first things I did was proclaim the tablet banished from the room if it did that again. (In normal life I might mention and we would talk it out and easily come to an agreement, nobody orders anyone around.) And I asked my nerd husband why he still hadn’t fixed that *%( iPhone. Because it hadn’t updated–that’s why Nest hadn’t recognized it. Oh. (Feeling very small.) And it didn’t update because I have too many pictures because I haven’t moved them to the computer because I want to still have all the baby pictures of the grandkids on it and I don’t want to sort through the thousands of not-grandkid ones. And you told me that when you got back from that trip. I tried to get up, did the dizzy thing in a grand way, went back to bed, and owned up to the accompanying chest pains. I was getting a little less growly but it was a process and there were things I’d wanted to do today but I was in no way driving a car this morning and if I don’t drive him to work well that’s that for the day–we only have the one. And usually we like that. He gets to decompress at the end of the day and we get time together that’s just for us with nothing else calling at us. By the time he left for work I was, I hope, closer to my normal daytime self. He was a peach and I wanted to live up to that no matter how tired I was. A little after noon I checked Facebook to see if anyone needed to be wished a happy birthday. It’s the 27th already!? It is?! Dang. Forgot. Busted. And loved. All at once. It’s been a life. Love you, too, honey, happy anniversary! There were visiting speakers from out of state tonight, a mother and son, and we went to hear. One of the perks of college towns and all that. At the end, Ann, the widowed mother (not to mention a professor), told the story of why she’d never met her mother-in-law: the woman had died when Ann’s husband had been two. Her sister Frances had come to visit her in the hospital, where in grief she implored her sister not to die. Her sister, fully aware she was losing that fight, asked her visitor, a young mom herself, Frances? Where are your children? A surprised, Well, I left them with…! They’re in good hands…! I won’t be away from them for long, it’s okay! And that was Frances’s answer, the words echoing through the years to come and in memories past: her own mother had died when she was eight. Her grown sister had taken her in. Frances took in the motherless newborn and raised him with her own five children for six years till his father felt he could cope with the day to day, while Ann’s late husband would be taken care of by the older surviving sister till then. Frances is my grandmother. Her daughter Frances is my mother. I got a gasp and a hug and a “How is your mom?! I LOVE your mom!” and in an instant the world became a smaller, better place. Mom and Dad? Ann says hi! I’ve been debating how to describe this without going on at great length about the neurological effects of having been rear-ended in ’00. Eh. Those who’ve seen me walking know what I’m talking about. Last night I was at Trader Joe’s, i.e. a not very big grocery store. Three tall 20-something men in bright red t-shirts were laughing and joking and enjoying each other’s company and taking up a fair bit of the aisle while me with my cane in my left hand and pulling a cart with my right did too. We had to each let the other(s) go by a few times. What passes for balance for me is all tactile and visual feedback confirming the direction of up. Bright orangey-red close to my face provokes extra wobble. I was looking at some new vegan product in the refrigerator section thinking, Hey, dairy-free for my allergic kid! when they caught my peripheral vision and I turned in time and saw. They were mimicking how I’d looked trying to go past them in those shirts (which they of course couldn’t have known anything about) in those narrow spaces. I looked at them with a slow-motion grin and an appraising look and pronounced, You guys dance like I walk. They burst out laughing–just a little too hard, meaning they knew they’d been caught and were relieved to find out that the little old lady had a sense of humor. Sometimes having been a mother of teenagers in a past life pays off. And who knows if, thirty years from now, they might need to remember that one can be damaged and still be able to laugh over the whole thing. Start over on bigger needles with 60 fewer stitches and in a lace pattern which of course will relax outward once water hits it. Today’s afghan is in the multi-color “Anniversario,” celebrating Malabrigo’s 10th year, of which I bought the bag of ten. 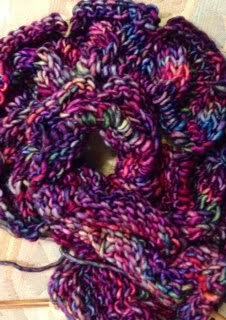 Maybe add an edging later once I see how all the variations between all the skeins play out. (I’ve learned.) 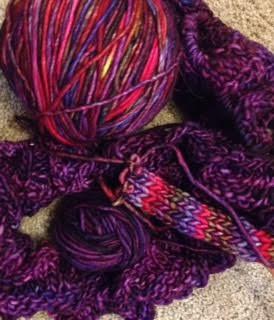 Note that I’m starting with the skein that most closely matched yesterday’s “Paysandu” purple. But I’m not ripping yesterday’s out. I had the first of those three skeins of Mecha knit up quite tightly on 4.5mm needles, deliberately so and in a pattern that tends to collapse in on itself for the increased warmth of that, too–but that means that for a 56-60″ wide blanket by golly I was getting three and a quarter inches’ length per skein. I dare the wind to try to blow through those stitches. But to get it to the length I wanted would require 19 more skeins. Blink. Yow. As I type this I realize that it means twice the wool in not much more than the same space as what I’m making now, and hey, if you want warmth and cushiness…. So I have to do that other one, too. Eventually. It helps that I love it. I think the thing to do is from time to time go find a few more skeins, and then more skeins, and then more skeins, in colors that I think will go well with the start of it and just play with it from there. No hurry. I even found a fourth Paysandu skein from my Stitches stash and it matches as well as any of them (pretty much). So many things to learn there. Friday 6/10. The mountain goats as seen from the boat. Barely. But when they lifted their heads you could tell they really were what the captain said they were. Reindeer’s antlers, while they’re growing in, are full of not only the blood that nourishes that growth but nerve endings, and we were told it would be painful to the animals if we were to touch those. So we didn’t. Instead, they passed around a single antler that had been shed at this same velvet stage to satisfy our curiosity, and it was very much as soft as it looked. Saturday 6/ 11. A river, whose name escapes me, and one of the trees on our son-in-law’s mom’s property. That water was melting glacier, cold and moving fast. I splashed my hand a bit at the edge in its honor, like I traditionally do at the Potomac River any time I go home: to make this one a part of me, too, now–and I think to claim all his family as our own in the gesture. We met some of them Sunday and I got to thank his mom for raising such a fine man. Devin pointed out the cowslip and the devil’s club, two plants whose leaves looked very much alike and yet one was welcome but the other was infested with poisoned spikes. You do not want to walk through that one. We stayed on the trail. Here, this one over here is cowslip. See that stalk that looks like it has an upside-down fig at the top? There are no spikes on its leaves. It’s safe to go near. But see, this is devil’s club right next to it. It will stab you right through a pair of jeans. I discovered this evening that, actually, it’s being studied as a treatment for TB. Wishing good thick gloves to the ones doing the studying. 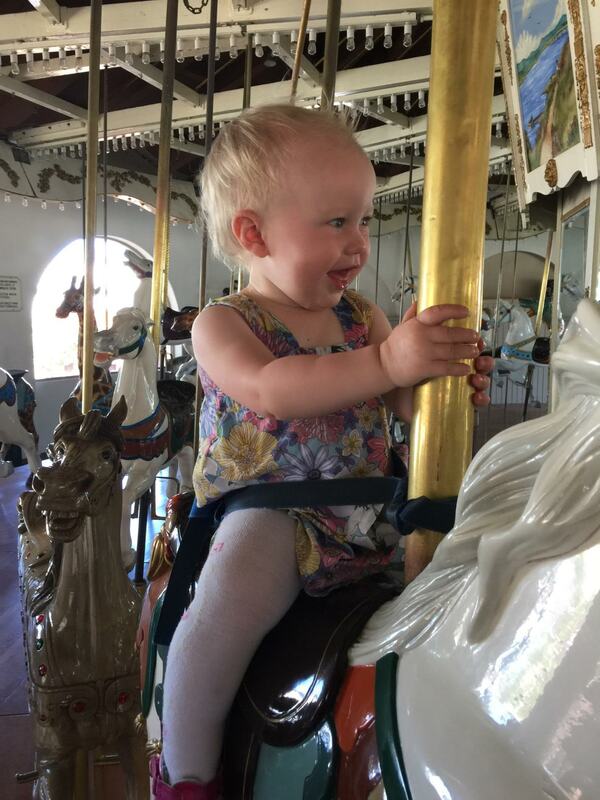 One last photo, sent to us tonight: Maddy is eighteen months old this week. Already. Somehow. Someday she and her brothers will go visit their aunt and uncle and learn to look carefully at big pretty leaves. And then go feed the reindeer. The two and a half mile WWII-era tunnel under the mountain is one narrow but tall lane. It is also an active railroad line. Each side each way each type, train or car, has designated hours when they are allowed to proceed, with strict warnings that there are cameras and that the 30 foot distance between cars will be enforced. Yeah, you don’t want an accident under there. Nor for a straggler car to find a train coming at it. Yow. So yes, that tunnel is carefully monitored at both ends. But when you get to the other side! We took the five-hour Klondike Express tour of the Chugach National Forest via Prince William Sound. I kept looking at all that vast, vast space and being agog at the idea of cleaning all of that up post-Exxon Valdez. How on earth had they done it? The Chugach, they said, was bigger than the state of New Jersey. The captain pointed out one part of the shore a goodly ways off and mentioned that it was 30 miles away at that spot. 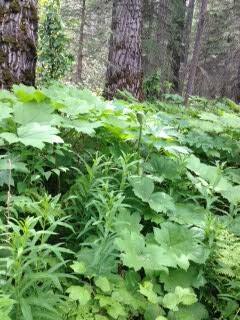 And here’s the surprise: Chugach is also a rainforest. Yes, a lot of it falls as snow, but 80-100″ worth of precipitation a year, and it being summertime, there was a dense, lush green between the water line and the tree line towering above. Icebergs, glaciers, sea otters, harbor seals on the dense field of ice chunks where the orcas did not want to go, a humpback whale breaching, a much larger black whale tail (Minke? Orca?) slapping the water in front of us, blowholes blowing, mountain goats, the tiny white dots on the rocks pointed out to us by the captain. Surprise Glacier in the very act of calving. The captain pulled up close to it and a member of the crew dipped a fishing net into the water. Not for salmon: he wanted us to be able to touch a piece of glacier. Then one large one was broken up onboard and a glass of glacier was offered to all, a little water on top. It took a long, long time to melt. One tall mountainside, hemmed in by all that white ice, was itself a sheer gray rock face top to bottom. In 2003, we were told, that was all glacier, too–but it is no more. Trees would start growing out of the crevices soon. (Pointing around the bay) See those sharply pointed peaks? they asked us. Now, see the ones that are smoothed over at the top? The smoothed ones had glaciers grinding them down. The brochure for our catamaran said we would go past rookeries, and we did see a seagull one at a distance, but overall they seemed sparse just then and the captain opted to spend enough time trying to give us a good view of the whales that he knew he had to get us back in time to make our tunnel time. As we finally disembarked after a little over five hours I was quietly just a little disappointed that I hadn’t been one of the ones who’d seen a bald eagle overhead. Wrong side of the boat at the wrong time. Just then an adult bald eagle in full striking black and white flew low over our heads right there. And was promptly dive-bombed from behind by the only crow I saw in all of Alaska. The eagle utterly dwarfed it but was willing to mosey on out in nice, slow motion, letting us tourists get that good view first. We would later see more eagles soaring overhead, twice, on other days. But that was the one that welcomed us to Alaska on our first full day there. Alphonsos from Dani and his mom! Dani, the instigator of my mango tree, came over with his love Svetlana with a special gift from his mother in India: actual fresh Alphonsos, sent from the tree he’d grown up with so that we could know what we had growing out there. A deep, wondering (will it smell like last year’s blossoms?) satisfying whiff… I am in awe that he was willing to part with them. He told us his mom was as enthused as he and I both are that my tree is growing here and doing well. Even if the weather’s been too cool and the tree too young this year for it to produce yet, it did bloom last year. So next year. Now that I know that warmth makes a difference in inducing flowering from the buds, not just in protecting them from harm, I may buy a plastic greenhouse cover for it. There’s one with a zip-down window to keep it from overheating. We took them outside and showed them the tree and Dani took video, I think to introduce us to his mom, although in the few seconds he had it going I didn’t figure that out fast enough to tell her thank you. To Dani’s mom, if you see this: Thank you so much! And to Dani and Svetlana, Thank you to you, too! I reiterated my promise that they will get one of our very first mangoes. I can’t wait to share back. A little more on Alaska: I’d been disappointed I hadn’t seen the twelve-foot grizzly we’d been told was on display at the airport; the kids had said it’s to warn the tourists not to be stupid. While we were waiting for departure, our last chance, there it was after all. Look closely: past its glass display case there’s a row of seats and at the end closest there’s a man sitting hunched over his cellphone, not knowing he’s being used for scale. Other than that we did not, to our knowledge, go near a bear. We did, however, see one single crow: at the edge of a bay, fearlessly divebombing the backside of a retreating bald eagle that had flown low over the boat we were disembarking from. Nope, not a fishing boat, guys, sorry. The giant fig. Our very first Black Jack fig. (Tadaah!) 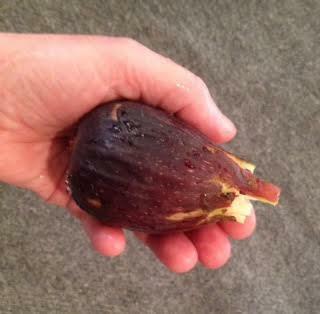 Maybe the biggest fig I have ever seen–it was huge. When I planted the tree last year I had no real idea what I would get, just that Ruth via Purlescence grew three kinds and that that was her favorite. How big they would get, how they would taste, how much the strawberry color would fill up the inside vs the probably-blah plain interior edges (or if it would even be strawberry colored) I had no idea. Widely strawberried it was, and I’d show it to you but that after the thing was split top to bottom and shared it didn’t last long enough for that. Black Jacks set two crops, the main, and the breba figs that set at the end of the season and ripen in spring. Brebas are supposed to have less flavor, not having gone through the full heat of the summer. And we’ve had a fairly cool year so far. 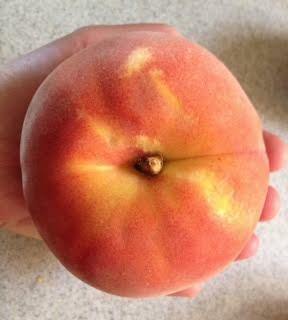 This was our only breba that made it through the winter and past the squirrel gnawing of spring. I guarded the last of the ten jealously with a plastic clamshell and tape and cinnamon on top and nylon mesh fabric around the trunk that the raccoons didn’t like stepping on and this was the long-awaited payoff. Now THAT’S a fig! Are the main ones really supposed to be better than that? Wow. Just, wow. Thank you, Ruth! I am finally motivated to set up the tall heavy (I can’t even move its box by myself) crop cage over that dwarf tree. Definitely. There are a whole lot of small green summer figs growing fast and just since last night the birds started taking small peck marks out of a few of them. Probably because they couldn’t get to that one. Every single one of those figs is worth whatever hassle it takes to protect them. I didn’t really know that before. We visited the Anchorage Museum, which is partly sponsored by the Smithsonian: the place was gorgeous (those long vertical strips of wood around the stairwell–so, so pretty) and a lot bigger than I expected. There were native artifacts and history. There was a piece of oil pipeline. There were representations of native and settler homes and boats from various times. There was the obligatory taxidermied musk ox, “lovingly donated” by the family of the late hunter who had taken the trophy. I read that and quietly guffawed at the mental image of his family dividing his estate, everyone groaning at all the living room space it would take up, the fact that shooting one was for a time highly illegal (relative to theirs I do not know, I saw no date), and trying to foist the thing on each other with someone finally going, I know! The museum! Maybe that’s not fair of me, but it amused me. Almost white, almost plastic-looking waterproof traditional jackets made from tanned Arctic animal intestines for easier weather days out fishing. Coats with fur turned inwards for colder ones, and sometimes, they said, a second coat would be placed over the first. Brrr. I had resisted pulling out the iPhone, not having seen any pronouncement on cameras being used but knowing they’re usually frowned on, while feeling that my quilter mom just absolutely had to see this gorgeous quilt: it was done in the tiniest pieces of the thinnest hides–I knew she would know just how much work went into that thing. (And Bev, I thought of you, too.) It showed the influence of the Russians who had come for sealskins and converts, mixed with the natives’ own patterns. I let a certain taller one talk me into their going back upstairs and snapping a photo of it for me. 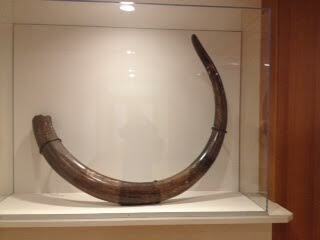 Then there was the woolly mammoth tusk. We are talking some serious ivory here. And there was Donna Druchunas‘s Arctic Lace book in the gift shop. I bet it flies off the shelves there, too.